Just received the following email from Jeremy Corbyn and I feel that it needs sharing as widely as possible in the face of disloyal MP’s and a hostile mainstream media. Our country is in crisis and needs a Labour Government. Our opponents are the Tories, not each other, and it’s disappointing that a small group of MPs have felt unable to continue to work together for the Labour policies that inspired millions at the last election and saw us increase our vote by the largest share since 1945. Labour won people over on a programme for the many not the few – redistributing wealth and power, taking vital resources into public ownership, investing in every region and nation, and tackling climate change. The Conservative Government is bungling Brexit, while Labour has set out a credible alternative, keeping all options on the table, including a public vote to stop a disastrous ‘no deal’ Brexit. When millions are facing the misery of Universal Credit, rising crime, homelessness and poverty, now more than ever is the time to bring people together to build a better future for us all. For those millions the only solution is a Labour Government that will invest in and transform our country. That’s why we must be united – not for ourselves but to deliver a Labour Government. The time to act is now – that is why I will be on the streets for the next few days practising what I preach and hoping it will result in a change of Government. It’s doubtful that anyone reading the DPAC blog will be in any doubt that Deaf and Disabled people in the UK cannot afford the Tories to get re-elected in June. Since 2010 the Tories have relentlessly attacked Disabled people, hitting the same group of people again and again with cut after cut. While inequality and poverty increased for Disabled people and the poorest in society, the rich have got richer. Since 2010 when the Tories took power the richest 100 people in Britain have increased their wealth by £55.5 billion. Meanwhile nearly half of the poverty in the UK is now directly associated with disability. Despite the UK becoming the first country in the world to be found guilty of grave and systematic violations of Disabled people’s rights, the Tories are determined to push through their planned welfare savings and ideological dismantling of state support whatever the cost to us. Already, just this year, changes to PIP brought in through emergency legislation to avoid Parliamentary scrutiny have taken essential support away from 164,000 people predominantly with mental health support needs, Employment and Support Allowance has been cut by a third for people in the Work Related Activity Group and in April the Government sneaked through three more hidden cuts affecting Disabled people. At the same time, social care packages are being cut to the bone leaving Disabled people trapped indoors without choice, control, dignity or freedom. Over the Summer, the Department for Work and Pensions will be rolling out the new “Health and Work Conversation” to create an added barrier before Disabled claimants even reach the notorious Work Capability Assessment. It is wrong to assume however that because the Tories have been getting away with this for so long that this is what the majority of the public wants. Most people are shocked and horrified when they find out what has taken place, incredulous that this can happen in the UK in the twenty first century and angry that anyone would and could pursue policies of, in Ken Loach’s words, such “conscious cruelty”. As I argued in a previous post, the majority of people would rather live in a fair and just society that values diversity and works for the benefit of the many rather than the few. What we have at the moment is a system when power and wealth are in the hands of the elite and that includes control of the mainstream media and the ability to communicate misleading information and to distract from the real problems in society. Thus we find people blaming migrants and benefit scroungers instead of challenging the real enemies who are those who choose to put profit before people. Precisely because we are the many and they are the few, the obstacles to achieving a fairer society are not insurmountable. Jeremy Corbyn’s two elections as leader of the Labour party in spite of everything the right wing of the party and the media threw at him, the second time with an increased mandate, show that united we can win. But social justice and a fairer society are not things that will ever be handed to us on a plate, they have to be fought for. With a General Election called and the prospect of another five years of Tory rule bringing with it insurance based systems to replace benefits and the NHS, now is one of those times when we have to step up and fight even harder because of the very real human cost that a loss will entail. We all have a part to play in the coming weeks. It is up to us all to do what we can to make sure the real information gets out there about what a Tory election will mean for Disabled people. On 2nd May DPAC will be officially kicking off our election campaign to #TrashTheTories with our #NotTheFuckingTories protest: https://www.facebook.com/events/247652075641387. We would like as many of you to join us as possible on the day but what is even more important is that members get out on the streets and your keyboards in the coming weeks to get that information out there to make anyone thinking of voting Tory or voting in a way that would help the Tories get in, think again. The voices of Disabled people can and does make a difference. In the 2014 local elections the Disabled campaign group Hammersmith and Fulham Coalition Against Cuts ran street stalls to engage with the public and hand out information about how the cuts were impacting on local Disabled people and what the different local political parties were saying on disability issues. Unexpectedly, Labour unseated the Tory Council and followed through on honouring significant pledges they had made to Disabled voters before the election on issues such as abolishing home care charging. We are asking all our members to think about what you can do and how you can help and encourage you to target marginal seats. There are some resources you may find useful at the end of this post. The media are often keen to cover stories about access to voting for Disabled people so do use this angle to get local attention. – Make sure your friends, neighbours and colleagues are registered to vote before the deadline on 22 May and plan to use their vote? – Leaflet on street stalls or door to door with information about how important this election is to Deaf and Disabled people? – Circulate information about what the different parties are saying on disability issues? – Hold a local screening of I Daniel Blake with a Q and A after? – Organise a local Deaf and disability hustings event? DPAC has some funding for leaflets, stickers and posters which we can post to you if you have an event organised. Please keep us informed with how you are getting on. It’s just another typical weekend where I enjoy spending my time wallowing in self-pity and bemoaning the structure of our couple-centric society. My loneliness helps create a vile bitterness that I try to harness and turn into a positive creativity, whether this works or not is for readers of my book and this blog to decide. I definitely have a “glass half empty” outlook, but deep down – below the negative surface – I know how lucky I am compared to many other people. Once in a while, I am reminded of this in no uncertain terms and I find it to be quite humbling. 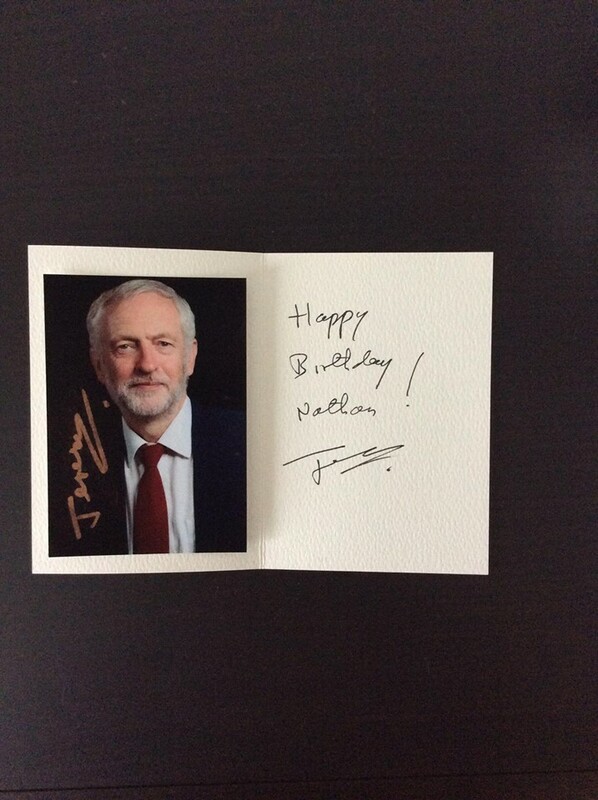 A couple of weeks ago, I received a birthday card and signed photograph from Jeremy Corbyn. The card was a little late in arriving, but I didn’t mind because someone I admire greatly had taken the time to send me his best wishes. I think this is a measure of the man as even though he must have a hectic schedule in trying to fight the Tories, he still found a minute to congratulate me on my 40th birthday. Cerys Matthews has been a very important figure in my life. In 1999, I had a car crash in Huddersfield while listening to Road Rage by Cerys’ band Catatonia. To read the full story of my accident in West Yorkshire, simply click here. Then in 2008, I went to watch Cerys, who was now a solo artist, perform a concert in Llangollen while my wife at the time went to Birmingham to meet an old friend. It was a great concert and Cerys was absolutely sensational. I still have fond memories of that evening even though my ex-wife later admitted that she had been snogging the face off her old friend. It’s a pity she couldn’t see what me and Cerys had got up to in my dreams. In 2010, I went to see Cerys perform again in Glyndwr University and was annoyed to find out that my sister had stayed behind and met Cerys while I rushed home to placate my newly employed Personal Assistant. I hope I will get the chance to meet her again soon. 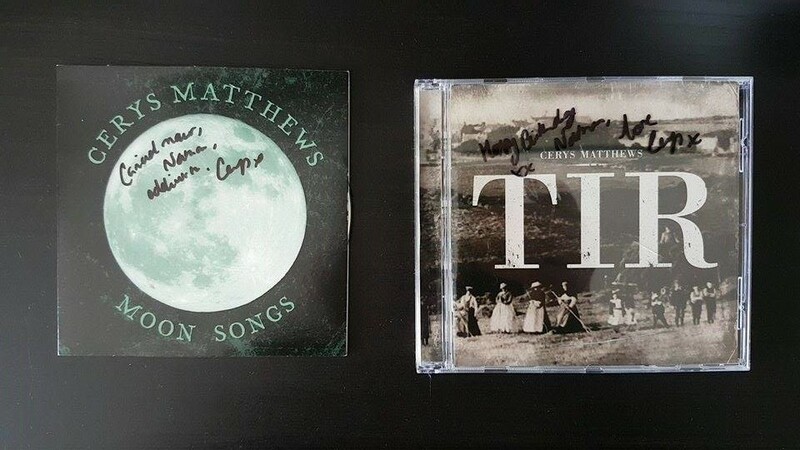 Therefore, imagine my surprise and delight when I received a parcel from none other than Cerys Matthews that included two signed albums and a note apologising for the late arrival. I was overjoyed to receive this and I will treasure these gifts, from such a talented beauty, always. However, the real star of the show is none other than my good friend Valerie Leney who organised my celebrity surprises. I am also going to watch Stoke City against Liverpool at the Britannia Stadium on April 8 thanks to Valerie contacting Eddie Niedzwiecki – former Wrexham goalkeeper and Stoke City coach – and encouraging him to mark my birthday with an unforgettable surprise. Hope you are well and good to see you, Lesley and Carwyn at the Racecourse the other week – such a shame about the performance and result [Wrexham lost 1-3 to Woking]. Firstly, a word on the Food Waste (Reduction) Bill as many farmers are being forced to throw away up to 40% of their v9eg every week because they’re millimetres off meeting supermarkets’ strict standards. This Friday, as my MP, please can you help change this by attending the debate on the Food Waste (Reduction) Bill? If you attend the debate and support this new law supermarkets would have to stop rejecting perfectly good food. I would also like to set-up a meeting with your good self to discuss independent living and ask if you would be willing to press the Tories hard about the amount of money they give to the devolved governments, or local authorities in England, to cover independent living. It is not good enough to simply pass on the same amount of money distributed in 2015 under the now dissolved Independent Living Fund as this does not account for new claimants or changes in circumstances. As someone with a progressive disability, I fear that the time will come – sooner rather than later – when I won’t be able to pay for the hours of care needed for me to remain living independently in the community. The Tories must be challenged and stopped from pushing ahead with fascist plans that boil down to nothing less than systematic social cleansing. I am also interested in discovering if there is any disabled representation with Wrexham Council and how to get involved.